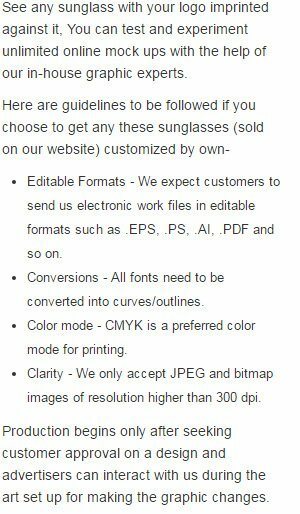 Custom printed kids classic sunglasses w/14 colors are great shades that will make your brand logo stand out. This classic sunglass appeals with its retro design and is perfect to gift during trade shows, weddings, summer promotions, outdoor events and beach parties. If you want to start in a memorable way, these kids’ classic sunglasses are great choice. Available in attractively low prices, you can order them in bulk to further your savings. Free online design proof and artwork assistance is offered. Request a quote to know savings that you can pocket on bulk ordering these promotional kids classic sunglasses w/13 colors. Available Colors: Black with Red, Black with Blue, Black with Neon Pink, Neon Yellow, Black with Orange, Blue with Blue, Red with Red, Black with Neon Yellow, Black with White, White with White, Black with Black, Neon Pink, Neon Green with Black, Orange with Orange, Neon Green.